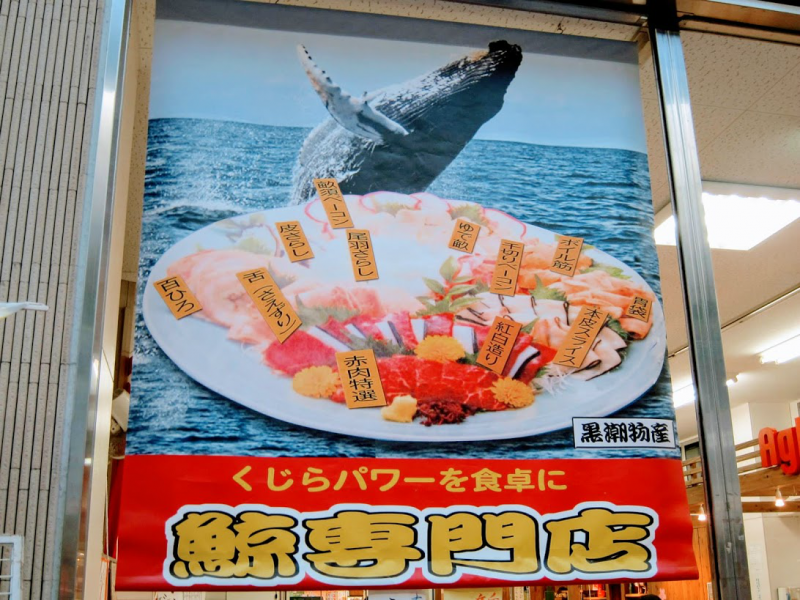 “Bring the power of the whale to your dinner table.” Poster promoting whale meat wholesale distributor in Kochi City, Japan. Photo by Nevin Thompson. On December 26, 2018, Japan announced it would withdraw from the International Whaling Commission (IWC) and resume commercial whaling in July 2019. Although this latest move will see Japan as one of the few countries to officially move against the IWC's 1982 moratorium on whaling, one of the Japanese whaling industry's biggest foes said it was “delighted ” by the latest news as it will allow the IWC to pass a motion establishing the South Atlantic Whale Sanctuary  — a move which will essentially outlaw and end whaling in the international waters of the Southern Hemisphere. The International Whaling Commission, an international body whose original purpose was to regulate whaling in order to conserve whale stocks, placed a moratorium on whaling in the world's oceans in 1982. The moratorium excluded  some aboriginal and subsistence whaling and the harvesting of some smaller species in coastal waters. Also excluded from the moratorium was “scientific whaling ,” which Japan carries out mainly in the Southern Ocean around the Antarctic. Under its most recent research plan , Japan aimed to capture 4,000 minke whales in Antarctic waters over a twelve-year period and killed 333 during the 2016 season. Some 122 whales were killed — potentially illegally  — in 2018. While there is virtually no domestic demand in Japan for the meat, until Japan pulled out of the IWC in December 2018 the purpose of the scientific whaling was to demonstrate the viability of re-starting a commercial whaling fishery. Organizations like Sea Shepherd Conservation Society have long condemned Japan's research in the Southern Ocean as a facade to catch minke whales . Now that Japan has pledged to end its scientific whaling program, it will no longer be covered by the IWC special research permit, thus relegating their commercial whaling project to the coastal waters of its exclusive economic zone (EEZ). If Japan decides to withdraw from the International Whaling Commission  (IWC) it will allow the IWC to pass the motion to establish the South Atlantic Whale Sanctuary thus effectively ending whaling in the Southern Hemisphere. Japan will now join Norway and Iceland as rogue outlaw whaling nations in the North Pacific and the North Atlantic. The Whale Wars (sic) in the Southern Ocean will soon be over. The focus now must be the Northern Hemisphere. Meanwhile, the governments of Australia and New Zealand opposed  Japan's decision to pull out of the IWC, as well as its plan to restart commercial whaling. Japan's decision to withdraw from the IWC was triggered in part by “Florianopolis Declaration ” in September 2018, where commission members voted  to continue the longstanding moratorium on whaling while rejecting Japan's proposal to restart a commercial hunt with “sustainable” catch limits of the relatively abundant minke whales in the Antarctic. Following the September IWC meeting and votes, Japanese government spokesperson Suga Yoshihide issued a statement  saying that, while “scientific evidence” proves certain whale species are abundant, the members of the IWC still focus exclusively on whale protection, refusing to take “any tangible steps” toward facilitating a return to “sustainable whaling,” the original goal of the organization. As a result, Japan decided to exit the IWC by the end of 2018 and discontinue its scientific whaling program entirely. Instead, Japan will hunt whales in its exclusive economic zone (EEZ), a vast amount of ocean territory  stretching far to the south of the main islands of the Japanese archipelago. Smaller species of whales including dolphins and pilot whales, which, unlike larger cetaceans such as baleen whales, are not covered under IWC catch guidelines, will continue to be hunted in Japan's EEZ. Note: ‘Pseudorca crassidens’ is commonly known as the false killer whale; ‘Berardius bairdii’ is known as Baird's beaked whale; ‘Globicephala macrorhynchus’ is commonly known as the pilot whale. Cucek also noted  the Japanese government announced that seven communities in Japan will participate in the new commercial whaling plan. The cities are located up and down Japan's Pacific seaboard, from Hokkaido to Honshu. Many of the communities, such as Taiji, which hosts a controversial dolphin hunt , already participate to some extent in smaller-scale whaling. One of the seven communities included in the new plan is Shimonoseki, located on the southwestern tip of Honshu. Represented in the Japanese Diet  by Prime Minister Abe Shinzo, Shimonoseki is the headquarters of Japan's pelagic whaling fleet and was the base of operations for the country's scientific whaling expeditions to the seas around Antarctica. Shimonoseki is also the home port of the Nisshin Maru , the world's only whaling factory ship. More than thirty years old, the Nisshin Maru does not conform  with relatively recent international environmental standards adopted for Antarctic waters and must be replaced. The sheer expense of replacing the vessel combined with the economic unviability  of Japan's whaling industry may have also caused Japan to use withdrawal from IWC as a pretext  to pragmatically end costly, subsidized Antarctic scientific whaling. Sea Shepherd Conservation Society also takes credit for Japan's IWC pullout. The conservation group has long actively opposed Japan's research whaling activities in the Antarctic and in Japanese coastal waters. The society's annual campaigns sparked Whales Wars , a long-running reality television program, and founder and CEO Paul Watson became an Interpol “international wanted person ” because of his anti-whaling and conservation activities. While Sea Shepherd has claimed victory over Japanese whaling off Antarctica, they say they will continue to fight against whaling in Japanese coastal waters.